Ocean Way Recording is a legendary studio whose client list has included everyone from Michael Jackson to Frank Sinatra to Radiohead and countless other major artists. It's live rooms are big enough for orchestras, so numerous Hollywood soundtracks have been recorded there, as well. 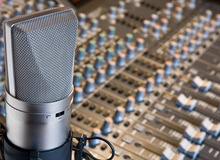 The gear inside ranges from modern Pro Tools systems to vintage processors and microphones. Watch the video and see for yourself!